New to Yoga? Brilliant, we know exactly how that feels. 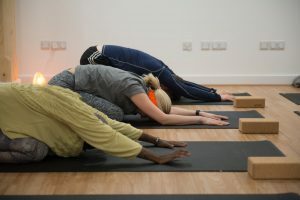 We all have to start somewhere and whereas other sports and exercise can be competitive, yoga is different: it does not matter if the person next to you can stand on their head – what matters is your own personal practice. Stay with your breath, let go, and allow our amazing teachers to guide you along your path. Come to any ‘suitable for beginners’ or ‘restorative’ class and have a go alongside others at the start of their yoga journey. Comfortable clothes that are easy to move in: shorts, leggings, t-shirt, vest. You might want some layers for slower, more relaxing sessions. We have a shoes-off policy in the studio and reception, and have changing rooms with pigeon holes for your bag. While we have CCTV in the entrance, valuables like phones and keys may be left behind reception. 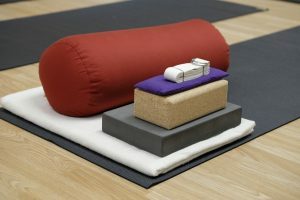 Mats and props are all provided but during a dynamic class you may want to bring a bottle of water and towel. It can get sweaty in there. We provide fresh drinking water, while downstairs in St. Augustine’s Centre is a wonderful world food café offering all your favourite drinks and snacks. You could even treat yourself to dinner after class or a glass of red. And there are no showers at Space Yoga Studio. Yoga is a physical and mental discipline that over time cultivates union of body, mind and spirit. While coming to class once a week helps you tune into your body’s needs and provides immediate health benefits, a regular practice leads to increased flexibility, strength and balance. Yoga also helps relieve numerous ailments, such as indigestion, asthma, arthritis, insomnia and anxiety. At a deeper level, you will notice yourself feeling calmer, more centred, grounded, compassionate, and have an abundance of joy to share with others. Yoga is both an exercise and/or a transformational experience, and can be as serious or as fun as you like. 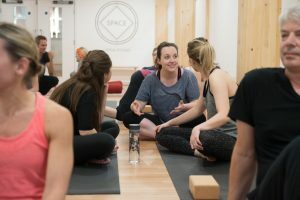 At SPACE we have created a studio that is dedicated to the highest possible standards of yoga teaching. But we also believe life is for living, and that having a good time is vital for good health and mental wellbeing. Wherever your path leads, come to a walk-in class and we look forward to welcoming you into our growing community.